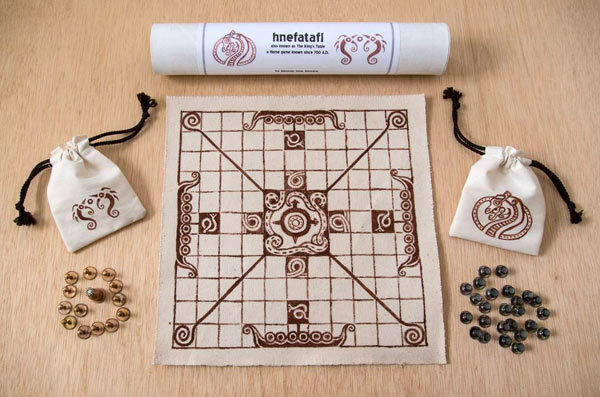 Hnefatafl, also called The King’s Table, is a two-player game originating about 400 A.D. in Iceland, Scandanavia, Ireland, and Lappland. 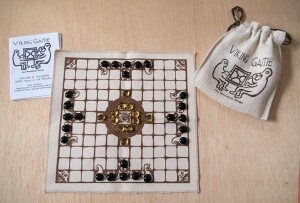 One unusual aspect, rare for a board game, is that the two sides are uneven, one having the king and twelve defenders, while the other is comprised of twenty-four attackers. The gameboards were often of wood and had 9 to 15 squares per side. The images at the top are of a set I purchased last summer at L’Anse Aux Meadows in Newfoundland. 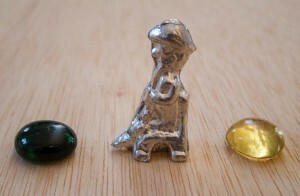 The “men” are glass while the king was made in a similar way to the Viking method of casting the hot metal in a soapstone mold. This set was made by the Wareham Forge of Canada, who fabricate reproductions for museums. Regardless of the number of squares to a side, the pieces are set up in the configuration shown, with the king in the center protected by his men. His objective is to get to any one of the four corner squares, his refuges. The attackers attempt to capture him or prevent him from reaching a refuge. Only the king can land on his central square or the four refuge squares. All moves are in straight lines vertically or horizontally, with no diagonal moves, and any number of squares per turn. No jumping is allowed. The king can be defeated by the attackers surrounding him on four sides, or three if along the edges of the board. An opposing piece can be eliminated by being flanked on either side or sandwiching it against a corner square. Each player can move only one man on each turn. The defenders’ side wins if the king reaches one of the refuges. The set shown here is one that I made especially for Miranda. 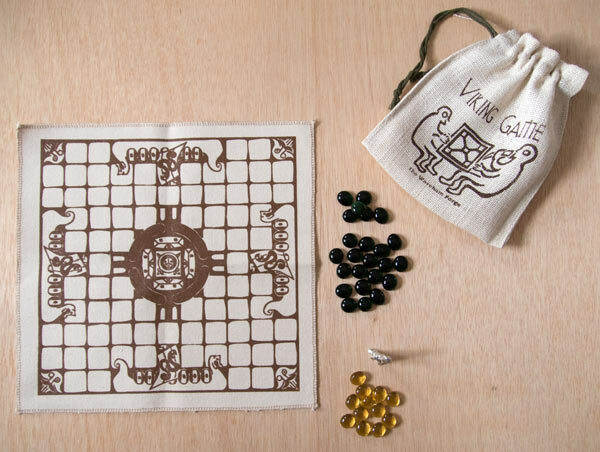 The Wareham Forge set all fits into one convenient burlap bag, however the board is folded in quarters. Instead, I designed mine to fit into a mailing tube so the board is not creased. The designs are painted with acrylics. 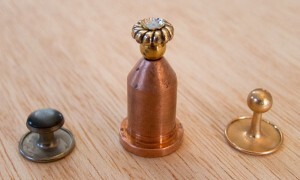 The “men” are found objects – tuxedo shirt studs of two styles. The king is a solid copper worn out tip from my plasma cutter with a round bead and two shaped ones attached by a nail through the top. Although in the 12th century this game was largely replaced by the more complex chess we are familiar with, hnefatafl is an intriguing precursor that is fun to play. Miranda (11) and Matthew (6) gave it a thumbs up, even though they are not Vikings as far as I know! Other sources about the rules (or here) or other makers of the game are surprisingly abundant. When I showed Hnefatafl to Miranda, she already knew about it from school. This entry was posted in creative living, life in general, Norse. Bookmark the permalink. Post a comment or leave a trackback: Trackback URL.